CONICET fellow participates in a project to develop smart antibacterial bandages. María Emilia Villanueva, L’Oréal - UNESCO "For women in science" Award 2016. Photo: CONICET Photography. It is essential to keep chronic wounds and diabetic ulcers protected from microbial activity in order to prevent possible infections. For this reason, it is more and more common to have bandages – which originally were aimed at protecting the damaged area from its exposure to the environment and absorbing exudate- that incorporate antibacterial properties with other qualities that optimize the healing process of the wounded area and avoid pain. 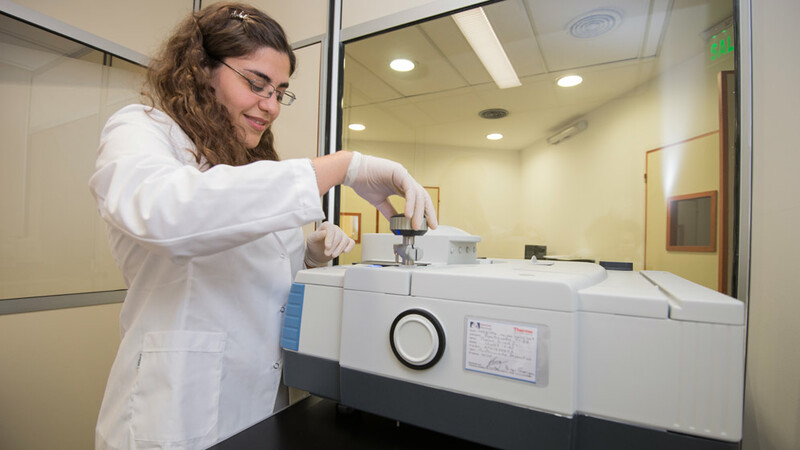 María Emilia Villanueva, CONICET Postdoctoral fellow who has recently been awarded with the L’Oréal-UNESCO Fellowship, is part of a research team at the Instituto de Química y Metabolismo del Fármaco (IQUIMEFA, CONICET-UBA). 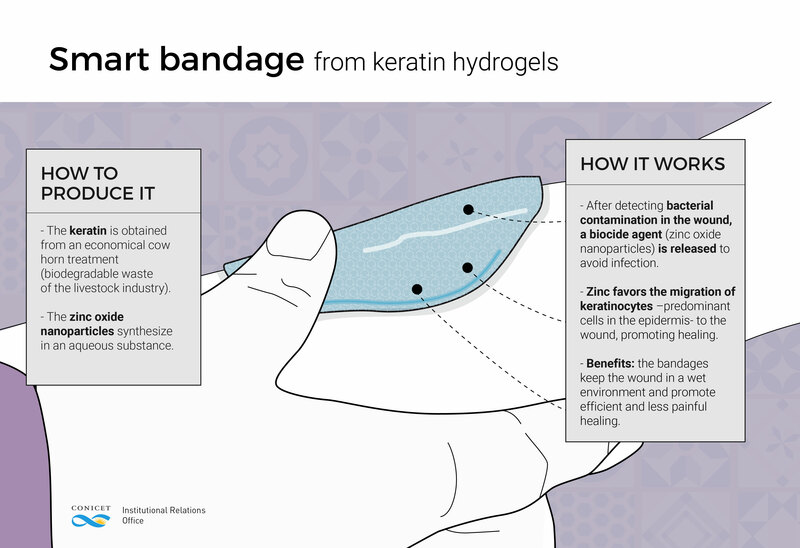 This group of scientists study the development of an smart bandage –from keratin hydrogel- which after detecting bacterial contamination in the wound releases a biocide agent (nanoparticles of zinc oxide) to avoid infections. “With a larger presence of microbes in the wound, a basic pH –that is to say, higher than 7- is generated and it swallows hydrogel, widen its pores and releases nanoparticles of zinc oxide located in the inner part to liquidate the polluting bacteria. The pH is acid –lower than 7- when the wound is clean. Thus the hydrogel shrinks, its pores get smaller and limit the path of the nanoparticles”, Villanueva explains. When the scientists designed the product, they aimed to make it with biocompatible and biodegradable materials, easy to use and economical. In brief, the idea was to make sustainable. The researchers obtained the from an economical cow horn treatment (biodegradable waste of the livestock industry) conducted at the laboratory and then they synthesized the zinc oxide nanoparticles in an aqueous substance, which guarantees a low toxicity level. “These nanoparticles, which are smaller than 100 nanometers, are less toxic than silver ions –most frequent bactericidal agent used in this type of products- what allows the matrix to be loaded with more concentrations of antibacterial material. Furthermore, as these are smart materials, the patient is not exposed to the bactericidal agent if there is no need. And the process to obtain zinc oxide nanoparticles is more economical”, Villanueva affirms. The greatest benefit of the hydrogel bandages is that they keep the wound in a damp environment and promotes efficient and less painful healing. Besides, in this case, the zinc –apart from its bactericidal properties- can favor the migration of keratinocytes –predominant cells in the epidermis- toward the would, promoting healing. “These materials are also an alternative for the use of local antibiotics that frequently offer resistance and make the skin sensitive” the scientist adds. As regards the manufacturing process, Villanueva says that as it is not necessary the use of advanced technology or imported equipment, we think is possible to produce it entirely in Argentina, “We hope that some medical products company can produce this development to make it available in the market”, the researcher concludes.